Breast Cancer Action is proud to stand with over 750 groups calling on Gov. Brown to phase out dirty fossil fuels and stop all new oil and gas infrastructure in California. As Governor of the nation’s most populous state, Brown has the responsibility to protect millions of Californians from harm, including breast cancer. And because California is both the third-largest oil-producing state and the leading food-producing state, strong protections here can also benefit millions more beyond this state’s borders. Many of the chemicals needed to drill and process fossil fuels are carcinogens and hormone disruptors. And this matters because breast cancer is a hormone driven cancer. Chemicals like benzene, which has been found at high levels in the bodies of oil and gas workers is a carcinogen so potent it’s linked to breast cancer in men. There is no safe level of benzene exposure. Breast cancer is the most common cancer for women in the U.S. today and a quarter of a million women are diagnosed each year. Despite the relentless messages we get about our individual responsibility for preventing our own breast cancers, we know that too many people who do all the right things and follow a “healthy lifestyle” still develop breast cancer. …It’s long past time to act on what we know. We know that hundreds of chemicals are used to drill and process fossil fuels. And we know that many of them are linked to breast cancer, and other diseases and disorders. We know that workers and nearby residents, who are often low-income and people of color, suffer negative health effects associated with extractive industries. In California, five and half million people—that’s 14 percent of the state’s population!—live within a mile of an oil or gas well. On top of the acute health harms to workers and frontline communities, the health and safety of everyone in the U.S. is on the line. In our interconnected world, we are all at risk of exposure to toxic chemicals used by oil and gas industries far away. …The science is in when it comes to the toxic chemicals used in fracking and routine oil and gas production. We know these industries threaten our basic needs: our food, water and air. California’s Gov. Brown can take a bold step to protect the health of women across the nation. Before leaving office next year, he can, and must, ban new oil & gas drilling in CA. …Our health and our lives are on the line. Join us in calling on Gov. 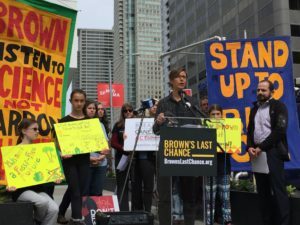 Brown to ban all new oil and gas infrastructure and protect the health of women across the country. Watch the full press conference here (Karuna speaks fourth at 13:39).